While visions of sugarplums may be on some people’s minds, area hunters are dreaming of snagging a big buck. It’s deer hunting season in Clinton County, Illinois. If you’re new to the area or looking to head this way to hunt, here is what you need to know. Deer hunting season is now through January 14, 2018, with specific dates varying depending on method used—archery, muzzleloader or firearm. Be sure to check the Department of Natural Resources (DNR) website for specific information. Carlyle Lake and Eldon Hazlet State Park, located at the lake’s southern end, are the two top draws for hunting year-round. The Carlyle Lake Fish and Wildlife area is located at the northern end of Carlyle Lake here in Clinton County, 60 miles east of St. Louis. Its diverse habitat includes about 2,000 acres of woodlands, as well as wetlands, grasslands, and dedicated cropland. You’ll find whitetail deer are plentiful here. Eldon Hazlet State Park encompasses 3,750 acres that are a mix of agricultural fields, woodlands, brush, restored grasslands and wetlands. Of this land, nearly 400 acres are open to general hunting, including whitetail deer. One nice additional service offered by the park is archery hunting for those who are disabled. Before heading out to hunt with family or friends, be sure to check the DNR site and read through the Carlyle Lake Hunting and Fishing Guide. If you’re seeking local insights, head to one of our local dining establishments. Often it’s over a hearty breakfast or dinner that you’ll learn just where to find that prize deer! 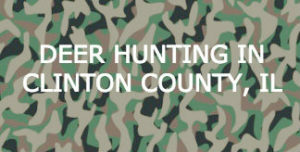 This entry was posted in Hunting and tagged Clinton County attractions, Hunting by admin. Bookmark the permalink.